This article is about the ancient town. For other uses, see Lakhish (disambiguation). This article is about Tell ed-Duweir or Lachish in the Shfela. For Khirbet ed-Duweir in Jordan Valley, see Lo-debar. Tel Lachish (Hebrew: תל לכיש‎; Greek: Λαχις; Latin: Tel Lachis), is the site of an ancient Near East city, now an archaeological site and an Israeli national park. Lachish is located in the Shephelah region of Israel between Mount Hebron and the Mediterranean coast. It is first mentioned in the Amarna letters as Lakisha-Lakiša (EA 287, 288, 328, 329, 335). According to the Bible, the Israelites captured and destroyed Lachish for joining the league against the Gibeonites (Joshua 10:31-33). The territory was later assigned to the tribe of Judah (15:39) and became part of the Kingdom of Israel. Of the cities in ancient Judah, Lachish was second in importance only to Jerusalem. One of the Lachish letters warns of the impending Babylonian destruction. It reads: "Let my lord know that we are watching over the beacon of Lachish, according to the signals which my lord gave, for Azekah is not seen." According to the prophet Jeremiah, Lachish and Azekah were the last two Judean cities to fall before the conquest of Jerusalem (Jer. 34:7). This pottery inscription can be seen at the Israel Museum in Jerusalem. Judean captives being led away into slavery by the Assyrians after the siege of Lachish in 701 B.C. This relief is important for the knowledge of Judean dress. Occupation at the site of Lachish began during the Pottery Neolithic period (5500–4500 BCE). Major development began in the Early Bronze Age (3300–3000 BCE). During the Middle Bronze II (2000–1650 BCE), the Canaanite settlement came under strong Egyptian influence. The next peak was the late Late Bronze Age (1650–1200 BCE), when Lachish is mentioned in the Amarna letters. This phase of the city was destroyed in a fire ca. 1150 BCE. The city, under protection of the New Kingdom of Egypt, was rebuilt by the Caananites. One of the two discovered temples was built at the northwest corner of the mound, outside the city limits and within the disused moat, which led the archaeologists to call it the Fosse Temple. However, this settlement was soon destroyed by another fire, perhaps from an invasion by the Sea Peoples or Israelites. The mound was abandoned for two centuries. Rebuilding of the city began in the Early Iron Age during the 10th and 9th centuries BCE when it was settled by the Israelites. The unfortified settlement may have been destroyed c. 925 BCE by Egyptian Pharaoh Sheshonk I. In the first half of the 9th century BCE, under the kings Asa and Jehoshaphat, Lachish became an important city in the kingdom of Judah. It was heavily fortified with massive walls and ramparts and a royal palace was built on a platform in the center of the city. Lachish was the foremost among several fortified cities and strongholds guarding the valleys that lead up to Jerusalem and the interior of the country against enemies which usually approached from the coast. The single inscription which identifies the location depicted in the reliefs reads: "Sennacherib, the mighty king, king of the country of Assyria, sitting on the throne of judgment, before (or at the entrance of) the city of Lachish (Lakhisha). I give permission for its slaughter"
In 701 BCE, during the revolt of king Hezekiah against Assyria, it was besieged and captured by Sennacherib despite the defenders' determined resistance. Some scholars believe that the fall of Lachish actually occurred during a second campaign in the area by Sennacherib ca. 688 BCE. The site now contains the only remains of an Assyrian siege ramp discovered so far. Sennacherib later devoted a whole room in his "Palace without a rival", the South-west palace in Nineveh, for artistic representations of the siege on large alabaster slabs, most of which are now on display in the British Museum. They hold depictions of Assyrian siege ramps, battering rams, sappers, and other siege machines and army units, along with Lachish's architecture and its final surrender. In combination with the archaeological finds, they give a good understanding of siege warfare of the period. So much attention was given to the success at Lachish also because, unlike it, Jerusalem managed to withstand Sennacherib's onslaught. The town was rebuilt in the late 7th century BCE during the decline of the Neo-Assyrian Empire. However, the city fell to Nebuchadnezzar in his campaign against Judah in 586 BCE. Modern excavation of the site has revealed that the Assyrians built a stone and dirt ramp up to the level of the Lachish city wall, thereby allowing the soldiers to charge up the ramp and storm the city. Excavations revealed approximately 1,500 skulls in one of the caves near the site, and hundreds of arrowheads on the ramp and at the top of the city wall, indicating the ferocity of the battle. The city occupied an area of 8 hectares (20 acres) and was finally destroyed in 587 BCE. Residents were exiled as part of the Babylonian captivity. During Babylonian occupation, a large residence was built on the platform that had once supported the Israeli palace. At the end of the captivity, some exiled Jews returned to Lachish and built a new city with fortifications. Under the Babylonian or Achaemenid Empire, a large altar (known as the Solar Shrine) on the east section of the mound was built. The shrine was abandoned after the area fell in the hands of Alexander the Great. The tell has been unoccupied since then. Lachish is mentioned in several books in the Hebrew Bible. The Book of Joshua refers to Lachish in chapter 10 (verses 3, 5, 23, and 31-35), describing the Israelite conquest of Caanan. Japhia, the King of Lachish, is listed as one of the Five Amorite Kings that allied to repel the invasion. After a surprise attack from the Israelites, the kings took refuge in a cave, where they were captured and put to death. Joshua and the Israelites then took the city of Lachish after a two-day siege, exterminating the populace. In 12:11, the King of Lachish is mentioned as one of the thirty-one kings conquered by Joshua. The city is assigned to the Tribe of Judah in 15:39 as part of the western foothills. Rehoboam son of Solomon's fortifications of Lachish are recorded in II Chronicles (11:9). In II Kings (14:19) and II Chronicles 25:27, Amaziah of Judah flees to Lachish after he was defeated by Jehoash of Israel, where he is captured and executed. The Book of Micah (1:13) warns the residents of Lachish that the destruction of Samaria by the Assyrians will soon spread to Judah. II Kings 18:14 mentions the Siege of Lachish; Hezekiah sends a message there offering tribute to Sennacherib in exchange for the city. In verse 17, the Assyrians leave Lachish and head to Jerusalem to begin the unsuccessful Assyrian Siege of Jerusalem. This is also mentioned in II Chronicles 32:9 and Isaiah 36:2. The Israelites learn of the departure of the Assyrians from Lachish in II Kings 19:8 and Isaiah 37:8. The Book of Jeremiah (34:7) lists Lachish as one of the last three fortified cities in Judah to fall to the Babylonian king Nebuchadnezzar II. In the Book of Nehemiah (11:30) Lachish is mentioned as an area where the people of Judah settled during the time of the Achaemenid Empire. The Assyrian campaign against Lachish is documented in a series of wall reliefs, now on display in the British Museum. Initially, Lachish was identified by Flinders Petrie with Tell el-Hesi, an identification supported when a relevant cuneiform tablet was found there. The tablet mentions Zimredda a governor of who is known from one of the Amarna Letters (EA 333). The current identification of Tell ed-Duweir as Lachish is strong but circumstantial, based mostly on the writing of Eusebius, the royal reliefs of Sennacherib, the site excavations, and an ostracon found there. The first expedition at Lachish, then Tell ed-Duweir, from 1932 to 1939, was the Starkey-Tufnell British expedition which included James Leslie Starkey as expedition leader, Olga Tufnell, G.L. Harding and C. Inge. It was funded by Charles Marston and Henry Wellcome with the aim of finding the Biblical city of Lachish. They succeeded in finding Lachish, with a "wealth of well-stratified pottery", a "key part of the ceramic corpus of Palestine", and the Lachish Letters, c. "written to the commander of the garrison at Lachish shortly before it fell to the Babylonians in either 589 or 586 B.C." Starkey was murdered in 1938 while traveling to Jerusalem to open the Rockefeller Archaeological Museum. Tufnell, Harding and Inge remained for the 1938-9 season. Tufnell returned to London and over the next two decades, worked at the Institute of Archaeology in London, "sorting, collating, studying and presenting the material found at Lachish". She completed her final publication Lachish IV in 1957. She had already become a Fellow of the Society of Antiquaries of London in 1951. The second was an Israeli expedition directed by Yohanan Aharoni that took place over two seasons in 1966 and 1968. The dig, which focused mainly on the "Solar Shrine", was worked on behalf of Hebrew University and Tel Aviv University. Aharoni published the findings in his 1975 publication, Investigations at Lachish: The sanctuary and the residency. The third expedition, 1973 and 1994, by a Tel Aviv University Institute of Archaeology and Israel Exploration Society team was led by David Ussishkin. :1-97:97-175:3-60 Excavation and restoration work was conducted between 1973 and 1994 by a Tel Aviv University Institute of Archaeology and Israel Exploration Society team led by David Ussishkin. The excavation focused on the Late Bronze (1550–1200 BCE) and Iron Age (1200–587 BCE) levels. The Issishkin expedition's comprehensive 5-volume report set a new standard in archaeological publication. According to Yosef Garfinkel, "The Starkey-Tufnell and Ussishkin expeditions set new standards in excavation and publication. They revolutionized our understanding of various aspects of Lachish, such as the later history of Judah and the pre-Israelite Late Bronze Age Canaanite city." Excavations of Tel Lachish continued in 2012 under the auspices of Tel Aviv University's Institute of Archaeology, conducted by Nissim Golding-Meir. In 2013, a fourth expedition to Lachish was begun under the direction of Yosef Garfinkel, Michael G. Hasel, and Martin G. Klingbeil to investigate the Iron Age history of the site on behalf of the Institute of Archaeology, The Hebrew University of Jerusalem, and the Institute of Archaeology, Southern Adventist University. Other consortium institutions include Virginia Commonwealth University, Oakland University and Korea Biblical Geography Research Institute. In 2014, during the Fourth Expedition to Lachish, led by archaeologist Saar Ganor, a small potsherd with letters from a 12th century BCE alphabet, was found in the ruins of a Late Bronze Age temple. One researcher called it, a “once in a generation” find. The Korean Lachish Excavation Team led by Hong Soon-hwa, reported that they had "uncovered a wide range of 10th century BC items, from houses with earthenware items and cooking stoves, to animal bones, olive seeds, spearheads, fortress walls and other objects" on July 5, 2017. A 2016 expedition found indications of Hezekiah's campaign against idolatry. The excavated gate shrine in the city contained a toilet in the holy of holies of the shrine, which according to researchers was "the ultimate desecration" of the shrine, as well the truncation of the horns of two altars. Since 2017, the Austro-Israeli excavation is exploring the Middle and Late Bronze Age strata at the site. The project is conducted a s joint project of Hebrew University and the Institute for Oriental and European Archaeology of the Austrian Academy of Sciences and is co-directed by Felix Höflmayer and Katharina Streit. The project is funded by the Austrian Science Fund. The first archaeological expedition, the Starkey-Starkey-Tufnell (1932-9) uncovered the Lachish letters, which were "written to the commander of the garrison at Lachish shortly before it fell to the Babylonians in either 589 or 586 B.C." The Hebrew letters were written on pieces of pottery, so-called ostraca. Eighteen letters were found in 1935 and three more in 1938, all written in Paleo-Hebrew script. They were from the latest occupational level immediately before the Chaldean siege of 587 BC. At the time, they formed the only known corpus of documents in classical Hebrew that had come down to us outside of the Hebrew Bible. The 1898 Reference by Bliss, contains numerous drawings, including examples of Phoenician, etc. pottery, and items from pharaonic Egypt, and other Mediterranean, and inland regions. ^ a b c d e f g h i King, Philip J. (August 2005). "Why Lachish Matters". Biblical Archaeology Review. 31 (4). Retrieved November 18, 2013. ^ Schaalje, Jacqueline. "Lachish". The Jewish Magazine. Archaeology in Israel. ^ Samuel, Rocca (2012). The Fortifications of Ancient Israel and Judah 1200–586 BC. Oxford: Osprey Publishing. p. 32. ISBN 9781782005216. ^ "Room 10: Assyria: Lion hunts". British Museum. ^ a b c d Garfinkel, Yosef; Hasel, Michael; Klingbeil, Martin G. (December 2013). "An Ending and a Beginning: Why we're leaving Qeiyafa and going to Lachish" (PDF). Biblical Archaeology Review. 39 (6). Retrieved January 30, 2018. ^ a b c d "Olga Tufnell, 1905-1985". London, UK: The Palestine Exploration Fund. nd. Retrieved January 30, 2018. ^ Henry and, Ros; Hankey, Vronwy (1 January 1986). "Obituary: Olga Tufnell (1904–1985)". Levant. 18 (1): 1–2. doi:10.1179/lev.1986.18.1.1. ^ Ussishkin, David (1978). "Lachish Renewed Archaeological Excavations: Lachish and the Previous Excavations" (PDF). Penn Museum. p. 18. Retrieved 21 February 2016. ^ Magrill, Pamela (2006). A Researcher's Guide to the Lachish Collection in the British Museum (PDF). The British Museum. ISBN 086159 161 5. Retrieved 21 February 2016. ^ Starkey, James Leslie (1938). Lachish I (Tell ed Duweir): Lachish Letters. Oxford University Press. ^ Olga Tufnell et. al (1940). Lachish II., (Tell ed Duweir). The Fosse Temple. Oxford University Press. ^ Ussishkin, David (1978). Excavations at Tel Lachish - 1973–1977, Preliminary Report (Report). 5. Tel Aviv. pp. 1–97. ^ Ussishkin, David (1983). Excavations at Tel Lachish - 1978–1983: Second Preliminary Report (Report). 10. Tel Aviv. ^ Ussishkin, David (1996). Excavations and Restoration Work at Tel Lachish: 1985–1994: Third Preliminary Report (Report). 23. Tel Aviv. ^ Wiener, Noah (November 8, 2013). "Khirbet Qeiyafa and Tel Lachish Excavations Explore Early Kingdom of Judah: After seven seasons at Khirbet Qeiyafa, the team heads to Lachish". Washington,D.C. : Biblical Archaeology Society. Retrieved January 30, 2018. ^ "Publications and Bibliography". Collegedale, TN: Southern Adventist University. nd. Archived from the original on August 26, 2016. Retrieved January 30, 2018. ^ "Potsherd With Canaanite Inscription Unearthed At Tel Lachish". December 12, 2017. Retrieved January 30, 2018. ^ Sass, Benjamin; Garfinkel, Yosef; Hasel, Michael G.; Klingbeil, Martin G. (2015). "The Lachish Jar Sherd: An Early Alphabetic Inscription Discovered in 2014". Bulletin of the American Schools of Oriental Research. The Fourth Expedition to Lachish. 374 (374): 233–245. doi:10.5615/bullamerschoorie.374.0233. 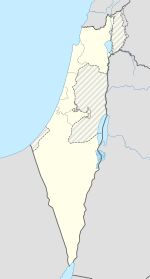 ^ "Israel's Lachish is a planned city from the Rehoboam period". Kukmin Daily. Seoul, Korea. July 11, 2017. Retrieved January 30, 2018. ^ "Excavated Olive Seeds May Confirm Area as Rehoboam Period Archeological Site". Kukmin Daily. Seoul, Korea. July 25, 2016. Retrieved January 30, 2018. ^ "When a king means business: Archaeologists find stone toilet that desecrated massive shrine". Retrieved 7 January 2017. ^ Albright, W. F. (1938). "The Oldest Hebrew Letters: The Lachish Ostraca". Bulletin of the American Schools of Oriental Research. 70 (70): 11–1. doi:10.2307/1354816. JSTOR 1354816. ^ Ussishkin, David (1977). "The Destruction of Lachish by Sennacherib and the Dating of the Royal Judean Storage Jars". Journal of the Institute of Archaeology of Tel Aviv University. 4 (1–2): 28–60. doi:10.1179/033443577788497777. Grena, G.M. (2004). LMLK--A Mystery Belonging to the King vol. 1. Redondo Beach, California: 4000 Years of Writing History. ISBN 978-0-9748786-0-7. Wikimedia Commons has media related to Tel Lachish.